Antonella Anedda, Stefano Dal Bianco, Alessandro Fo, Antonio Prete. The round table Fra poesia e prosa features Antonella Anedda, Alessandro Fo, Stefano Dal Bianco and Antonio Prete and was organised by Laura Barile at the University of Siena. The four invited poets express their positions with regard to poetry and prose in their respective practices. While Dal Bianco and Fo trace a clear distinction between prose, narration and versification, Anedda and Prete detect the presence of poetry also in writing practices that don't necessarily respond to its forms, focusing in particular on the relations between poetry and essay. The debate also includes live readings of poems by the four authors that are re-published in the transcript. Language: Italian. Judith Balso's contribution Prose et poésie. Considérations à partir de Monsieur Jourdain et de son maître de philosophie is based on the idea that the question of poetry and prose lays in the interaction between language and things more than in genres and literary forms. So that it is possible to call “poetry” any writing practice assuming that ordinary language doesn't fulfil our need to say and taking things instead of nouns as the very starting point for a new relation language-world. The essay is supported by a variety of references spanning from Molière to Pessoa. Language: French. Fabien Vallos's essay Le poème & la poésie embraces a philosophical approach in order to investigate the question of poetry and prose. Starting from Hölderlin, Heidegger, Benjamin and always dealing with the Greek tradition, Vallos builds up his argumentation on the notion of poiesis, i.e. on a conception of poetry, but also of art and theory, as expression of the making hic et nunc. Vallos claims that the core feature of poiesis is what he calls “an element of adventure” that stands against the “authority of representation”. The notion of “adventure”, as Vallos explains, means “what happens”, “what is there”, hence it has to be opposed to representation as a reconstruction a posteriori of the event. Language: French. This contribution, supporting the final proposition of Wittgenstein's Tractatus and paraphrasing it, upholds the thesis that, in Bachmann, "everything that can not be thought (meaning that it is not representable), must be told". In this sense, the poetic word she was looking for, living in the mystical threshold of silence, wants to present itself as a "signification of the unspeakable, or it wants to be able to explain the world but without getting out of it. 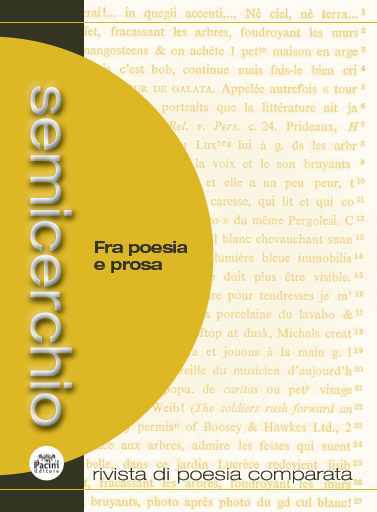 Analysis of the influence of the poems of Giorgio Caproni on the lyrics by Lucio Dalla and Samuele Bersani, detecting their intertextual relationships. Poesia italiana in francese: «Tenir tout un monde sur la paume et puis souffler».